Pre-heat your oven to 220 degrees. 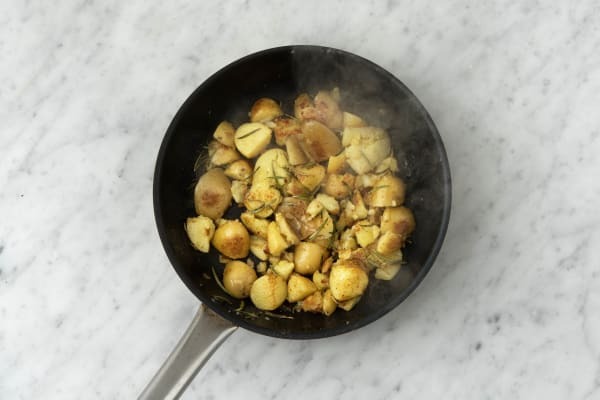 Peel and finely chop the garlic and roughly chop the mushrooms. Peel and chop the carrot into sticks. Chop any large potatoes into quarters. 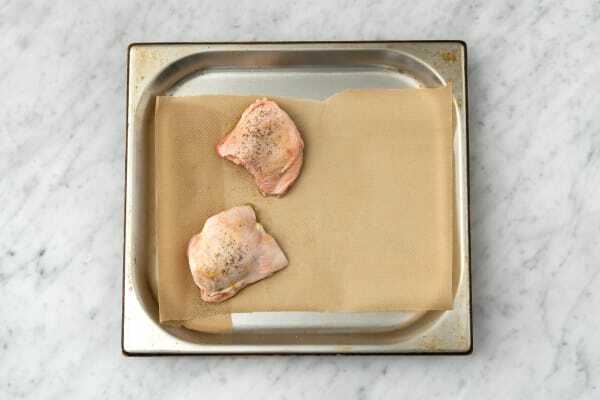 Pat the chicken skin dry with some kitchen paper. Rub a ¼ tsp of olive oil on each thigh and rub in a good pinch of salt and black pepper. Place on a baking tray and cook in your oven on the top shelf for 20 mins, until the skin is nice and crispy. Rest them out of the oven afterwards. Bring a large pot of water with a pinch of salt to the boil and add in your potatoes. After 12 mins, add your carrot to the pot and cook everything together for another 4 mins. Tip: Cooking your carrots with the potatoes saves on dirty pots and boiling more water. Meanwhile, heat a splash of olive oil in a frying pan on medium heat. Once it’s hot, add in the chorizo. When the chorizo has browned off slightly add in your garlic and cook for 1 minute. Tip: Be careful not to burn the garlic. 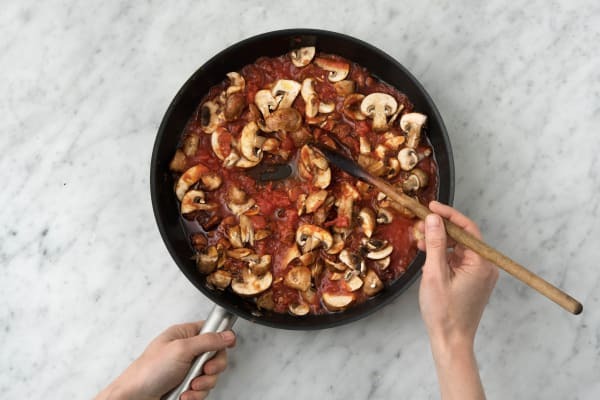 Add in the chopped tomatoes, mushrooms and bay leaf. Refill the tin with 2cm of water, swirl around and add to the pan too. Next stir in a good pinch of salt and black pepper. Leave to bubble away on low heat until it has thickened up (about 15 mins). 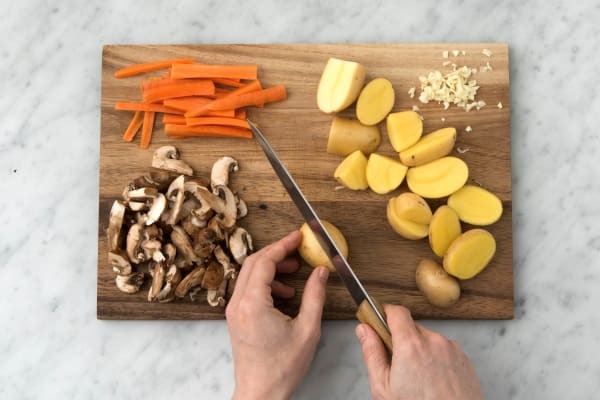 The potatoes should be soft enough to slip a sharp knife through them by now. Drain the water and put your carrots in a separate bowl. Let your potatoes dry off and crush them lightly with a fork. Season with salt and black pepper. Heat another frying pan with a splash of olive oil on high heat and add the leaves from your rosemary. Cook for 1 minute, then add the potatoes and cook until they are crisped up (about 5 mins). Tip: You can reheat your carrots with the potatoes for the last minute. 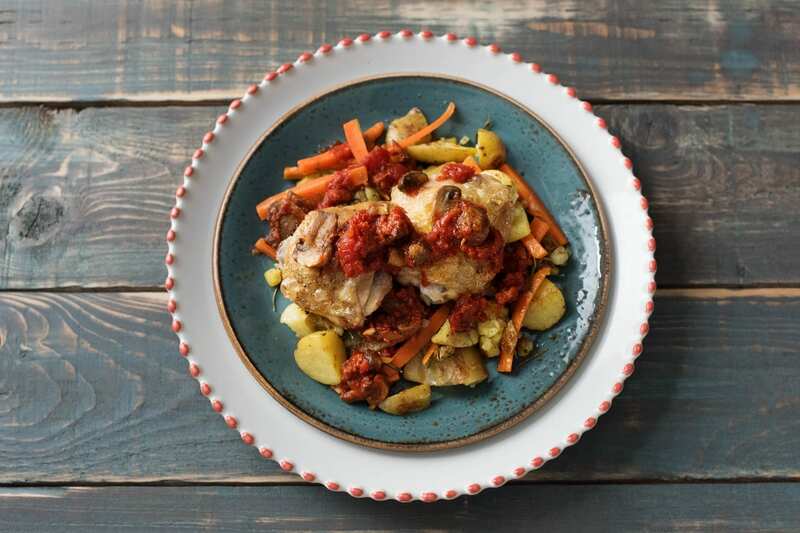 Serve your carrot and crushed potatoes in a bowl and top with your chicken thigh. Pour your chorizo infused tomato sauce over the top. In your most dramatic matador’s voice shout ‘Olé!’ as you serve it on the table.